Providing innovative and flexible ways to study B-cell phenotypes and functions. 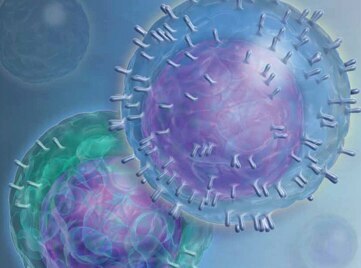 For more than two decades researchers have made significant discoveries about B-cell biology and phenotypes using BD Biosciences flow cytometry products, including instruments, reagents, and protocols. BD continues to support researchers by introducing innovative tools to study multiple aspects of B-cell biology. Newly defined, key markers include the transcription factors Blimp-1 and XPB-1s, which allow analysis of these key regulators in different B-cell subsets. To support and simplify the detection of these critical intracellular molecules in B cells by flow cytometry, we offer antibodies validated for flow cytometry, as well as optimized buffer systems for staining. Explore tools for studying multiple aspects of B-cell biology. Key markers include Blimp-1 and XPB-1s, which allow for analysis of different B-cell subsets. View experiment data using tools and techniques to study B cells, such as 10-color immunophenotyping, antigen density, and intracellular cytokine detection.